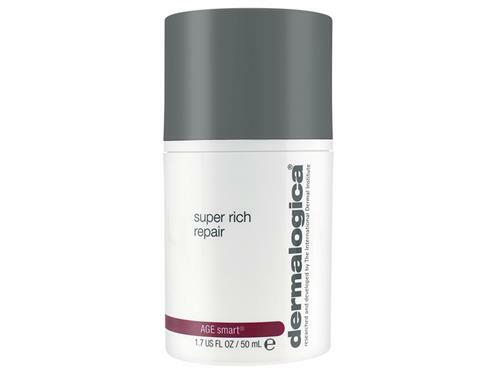 Deeply nourish dry, dehydrated skin with Dermalogica Super Rich Repair. This replenishing cream soothes and repairs skin exposed to extreme environmental conditions. Perfect for dry and mature skin types, Dermalogica Super Rich Repair is enriched with peptides, hyaluronic acid and antioxidants to rebuild your skin's natural moisture barrier and protect your complexion from free radical damage. Lipid-rich shea butter and jojoba seed oil restore essential hydration, leaving your complexion soft, smooth and perfectly hydrated. Tell us your thoughts about Dermalogica Super Rich Repair and receive 50 rewards points! Both my mum and I have highly sensitive, and dry skin. So far, this is the only creme that lasts all day and makes me forget about my face for once. This is my favorite go-to cream for winter. It is thick and protective. My skin drinks it up quickly. No sticky layer on skin. Rub a bit between your fingers for ease in smoothing on skin. It has been very hard to find a very good night cream for my very dry skin, so far this one is probably the closest one even if not as moisturizing as I would like. It's pretty thick at first and then kinds of melt in your skin. I like the smell. Still looking for my perfect cream though! Super rich for my dry skin! I love Dermalogica Super Rich Repair especially during each winter the heating on. It makes my face skin more soft and less dry. This is not a lightweight lotion. It’s thick and creamy for dry and/or older, thin skin. It makes a great nighttime moisturizer for skin in dryer climates and cold drying winters. I have found that it make my skin much more supple. Great cream. This product never fails. The price is very good and fair too for a lovely thick luxurious cream which will actually make a HUGE difference to your dry skin. My skin is and always has been chronically dry skin, with flakiness and terrible sensitivity. I have tried literally everything–from super expensive products to the very best of facials and cosmetic grade products but this cream actually works better than most. This moisturizer is great for my dry, sensitive skin. I put it on every night and it makes my skin feel so soft in the morning. It is perfect hydration for my dry skin. Love it. A sample of this product was included in an order I received and I was was pleasantly surprised how wonderful it felt on my skin. I have relatively dry skin and this product seemed to give my skin the boost in moisture that it needed. It does not lay on the surface but was totally absorbed. And, it’s not oily. It has become my primary moisturizer during the day and at night. I have ordered it twice now and will continue its use. I have very sensitive, combination skin. My neck tends to get very dry at times. I needed a cream that had some anti aging qualities but was still very gentle. Most of all, it needed to be rich enough for my dry skin. This cream was just what I needed. This is my second order of this product. It is a really nice moisturizer that I use at night, although it can be used in the morning as well. It makes my skin feel wonderful. I love this cream and have used it nonstop since discovering it. I slap on a lot of serums, creams and whatever else says it will help my skin. Having always had very sensitive skin, it can be an issue to have it feel good. Without fail, after all the rest is applied, I apply Super Rich Repair at night and love the way my skin calms immediately, is hydrated beautifully and glows as I drift off to sleep. My face is dry and getting fine lines. This rich, thick cream truly does moisturize my skin and smooths out wrinkles. It is very thick, but absorbs quite quickly. I am also super-sensitive, and this cream does not cause any redness or irritation. I love this cream. It is so rich and hydrating. I started using it about a month ago, and one of my clients asked if I had some work done on my face. I am convinced it was this cream's hydrating effect. I have dry skin and live in a dry high desert climate. I use this cream at night after applying Retin-A, and it is very soothing and hydrating. It is thick, so I rarely use in during the day. I have been using this for years at bedtime. I have very dry skin, and it is very nourishing. I look great I the morning. It’s fabulous for the winter months. I’m 59, the product softens the look of my lines on my face... non-greasy... love the product! This amazing cream is very thick, rich and hydrating. It spreads well and is not sticky, but it does leave a moist sheen on your face. I would not recommend this for oily skinned folks. The scent is lovely, a very natural herbal aroma with no perfumy notes. The scent does not linger once it's applied. Thick but feels great and moisturizes nice. Got the sample now buying full size. Great addition to my nightly regimen! This cream is a great addition to my nightly moisturizing routine. A classic oily and acne prone skin sufferer, in my late 30s I started noticing my forehead, eyelids and other delicate skin areas were getting super dry. This product has relieved those dry areas while not making me break out. My only issue is price, so I use it only where needed and sparingly. I received a sample of this cream and I used it on my neck. I use Retin A and my neck tends to be dry and sensitive. I noticed a huge difference after few applications of this cream.